The question of getting a dog has come up so many times and we nearly once got a puppy. After reading up on it and asking friends with pets I made the decision not to have one. I did not think it was fair on myself or the animal. I know at the end of the day that the responsibility will fall on me and I believe that four children is my limit. That’s not to mention the extra costs and responsibilities – taking it for walking, cleaning up poo, vets bills, insurance, grooming! Plus my house is a mess enough as it is without puddles of wee and a dog chewing my furniture! Georgie is the interactive pet is just like a real puppy. 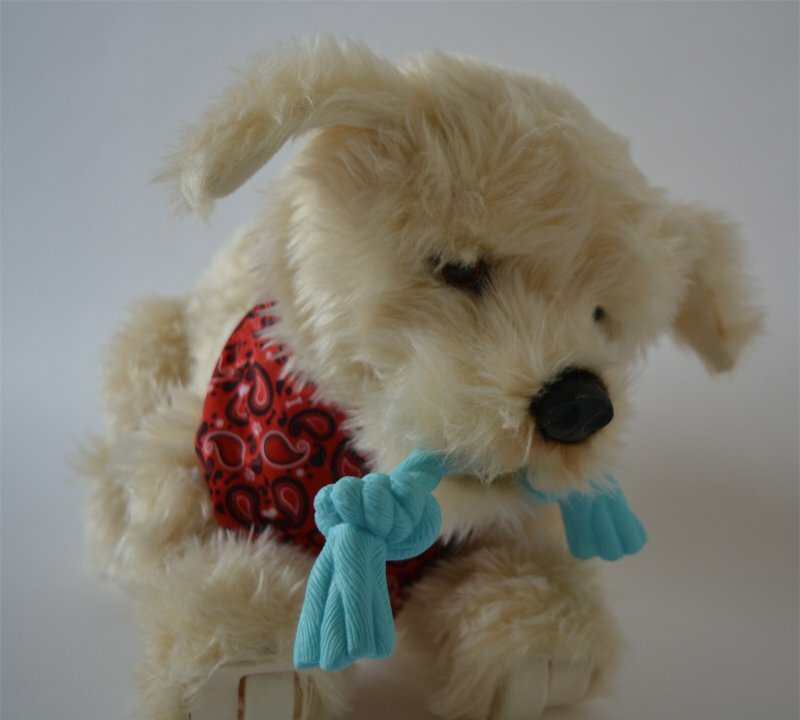 He needs taking for walks, having a bath and playing – but without the added hassles of a real dog. 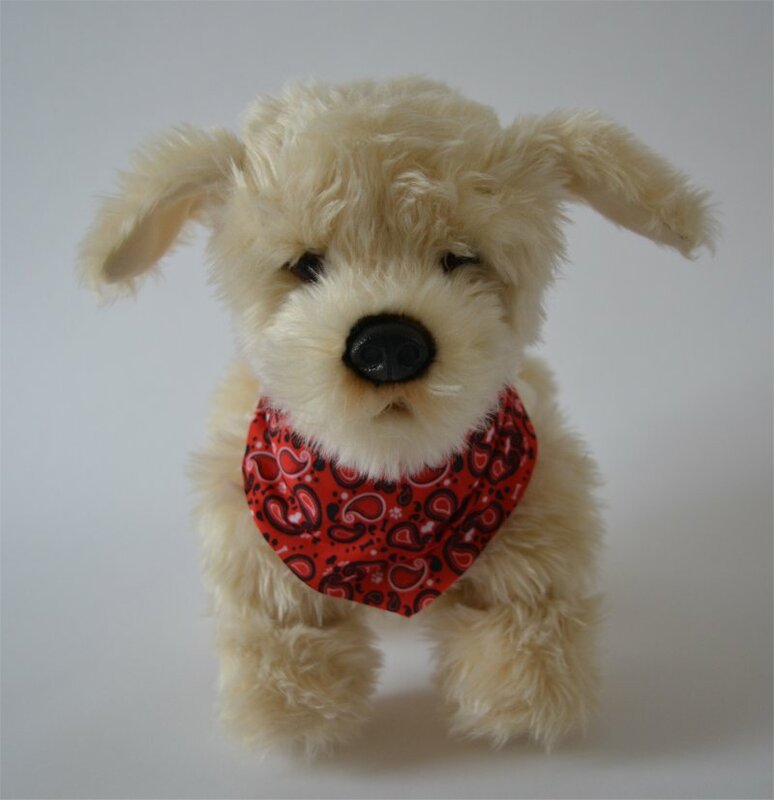 Plus Georgie is soft enough to cuddle and sleep with due to the plush fur and soft stuffing. Georgie has over 100 interactions, including responding to 12 voice commands: such as sit down; I love you; High Five; and Wanna Go For a Walk? Petting Georgie’s head triggers him to bark, yip and pant. After four pats Georgie will lie down, yawn, say I love you and go to sleep. Georgie will also go to sleep if left idle for 3 minutes. Once Georgie has gone to sleep he should be switched off to save battery (he will not work again without being turned off and on again). Georgie is suitable for ages six plus and works right out of the box – complete with rechargeable battery and cord. 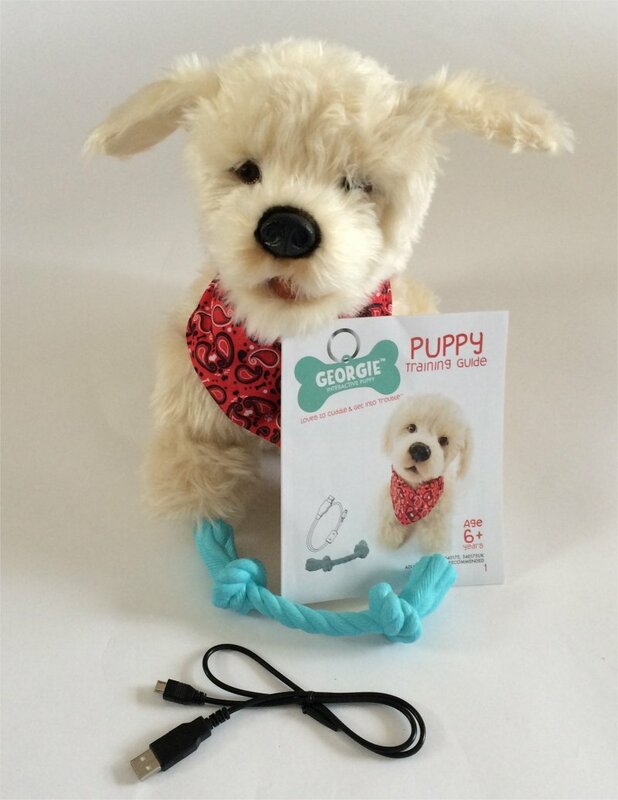 The handle on the box turns into a collar with name tag, and Georgie also comes with an adoption certificate, rope (for a game of tug-of-war), bandana, recharging cable and Puppy training guide. I did find it a bit annoying to have to say “Hey Georgie” and wait for a response before issuing each command, but it was good to see that he also responded to “Hi Georgie.” Also, although the commands and interactions are good you have to say the “right” things or he does not respond – ie you can’t just say, “Sit Georgie, sit!” This means either learning the commands or keeping the training guide with you. I am unsure if this develops over time as our Georgie is still new. Likewise, I understand the idea of saving the battery but it is a little tedious that he needs switching off and on again if he has gone for a short nap. Overall I found Georgie to be just like a real puppy but better – he has none of the additional expenses, mess and can do selfies! With a 100 interactions and 12 voice commands I think he offers really good value for money and will make a smashing Christmas present. It is also a good way to see if a child can look after Georgie without getting bored before going on to buy a real puppy. Priced at £99.99 and available from Smyths Toy Store, The Entertainer, ToysRUs and Argos. I received a Georgie interactive puppy for purposes of review. All words and opinions are honest and my own. Aw bless, very cute toy. I agree with you that getting a dog is such a huge decision and if it’s not the right time for you then it’s better not to get one. Ours are such hard work but I only have two children so the two dogs make up the number!